So is anyone else glad that Halloween is over? Not really the actual Halloween, just the endless bags of Halloween candy. I just can’t say no to those Kit Kats. I do know someone who is not glad it’s over. My hubs, Rick, has the most unbelievable sweet tooth that I’ve ever seen. I think he would eat nothing but candy for the rest of his life and would be happy. Halloween is definitely one of his all-time favorite holidays because of the candy. He can’t get enough. I got up one Sunday morning and told him that I was going to make homemade monkey bread. He was beyond excited. I knew that he was envisioning sweet, delicious dough just oozing with caramel. When I told him that it was going to be pumpkin, he made a face. My sweet husband is usually not very judgemental except when it comes to pumpkin (and maybe curry). He just has this face he makes when I say that I’m making anything pumpkin. Well, my friends, he was pleasantly surprised by this cutie. He absolutely loved it. I mean, he loved it so much that at one point he told me that he thought he was going to be sick because he had eaten so much monkey bread. Haha!! Just kidding. But I did totally win this one. 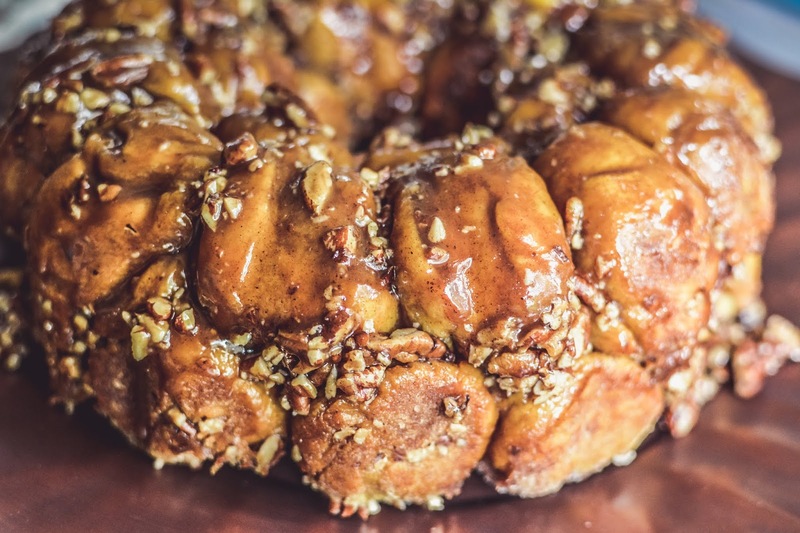 Monkey Bread is one of those fabulous breakfast foods that takes me all the way back to fourth grade, spending the night with Paige Leake and eating monkey break after a night of not sleeping at all at a sleepover. Her mom would make monkey bread and I thought it was the greatest thing ever. 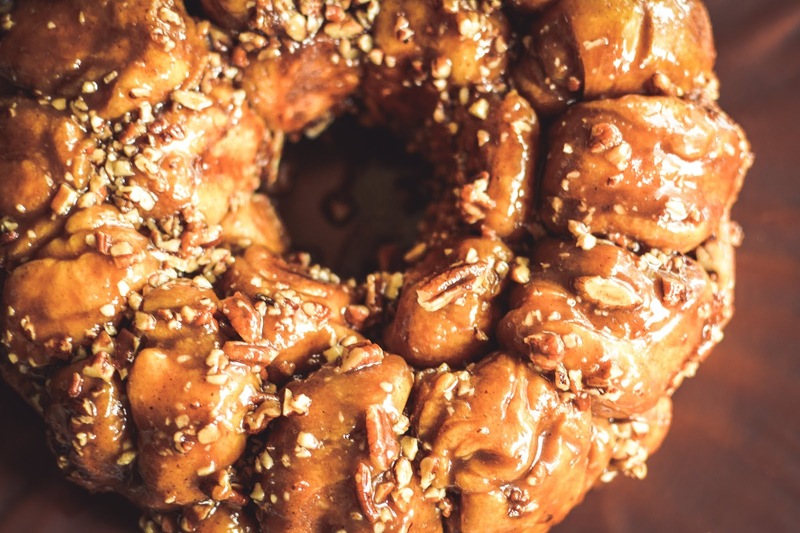 This monkey bread will make you never make the canned biscuit variety again. I’m definitely not knocking canned biscuit monkey bread. It’s absolutely delicious, but you can’t add pumpkin, chocolate, apples, etc… to canned biscuit dough. And once you make this dough you will see that you can change out the filling to just about anything you want for one fantastic monkey bread. 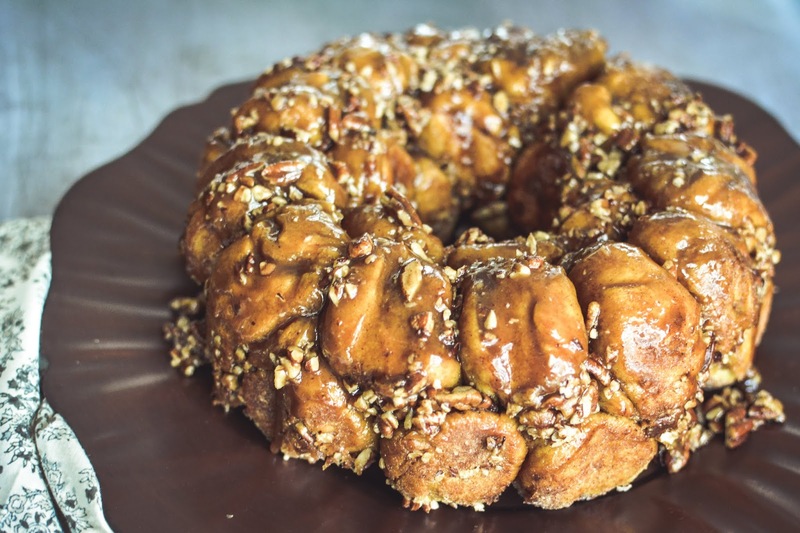 Just you wait until Mardi Gras when I make my King Cake Monkey Bread!! In a small saucepan, combine the milk and butter and place over low heat. Cook until the butter is melted and the milk just starts to warm, stirring constantly. Remove from heat and set aside. In the bowl of a stand mixer with the paddle attachment, beat together the brown sugar, pumpkin puree, pumpkin pie spice, and salt. Add the milk and butter mixture and mix until just combined. Add the yeast and mix again. Switch to the dough hook attachment and add the flour. Beat until the dough forms a ball and comes off the sides of the bowl, about 7 minutes. Transfer the dough to an oiled bowl, cover loosely with plastic wrap and place in a warm spot until doubled in size, about 1 1/2 hours. While the dough is rising, make the pecan caramel glaze. In a medium saucepan combine the brown sugar, butter, and cream and bring to a boil. Stir it every so often so that it doesn’t burn. Cook for approximately 5 minutes until the mixture has thickened. Remove from the heat and stir in the vanilla and salt. Set aside to cool slightly. Once the dough has risen, punch it down and transfer to a lightly floured surface. Cut the dough into 4 equal parts. Cut each part into 8 pieces (32 pieces). Roll each piece into a ball. To make the coating: Melt the butter and combine the sugar and cinnamon in a bowl or onto a plate. Dip each dough ball in the butter and then roll in the cinnamon-sugar mixture, coating heavily. 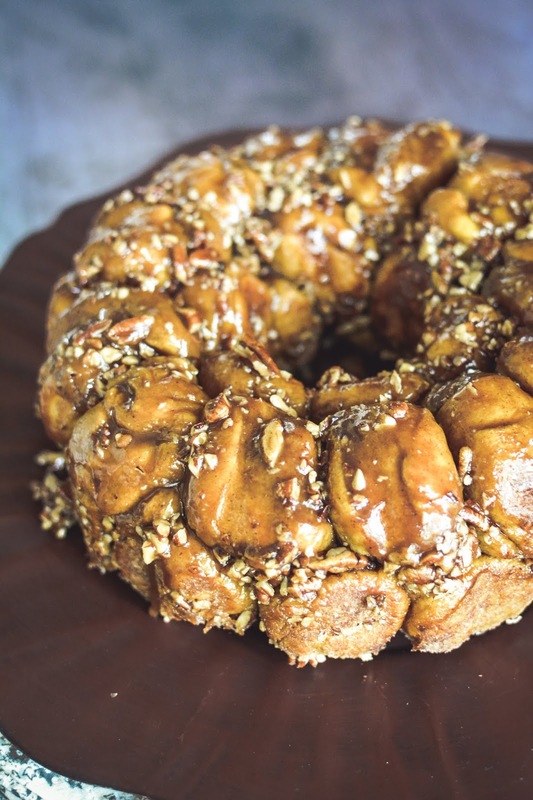 To assemble the monkey bread: Pour 1/4 of the caramel pecan glaze into the bottom of a bundt cake pan. Place 1/2 of the cinnamon-sugar dough balls into the pan. Pour 1/4 more of the caramel pecan glaze over the dough balls. Repeat with the remaining dough balls and the remainder of the caramel pecan glaze. Cover the entire pan loosely with plastic wrap and place in a warm spot and allow it to rise until doubled in size, about 1 hour. Heat the oven to 350℉. Bake the loaf for 30-40 minutes, until golden brown and the center is set. Remove from the oven and allow to cool in the pan for 10 minutes, then transfer to a large platter or baking sheet, flipping to remove.